16C58.83 Lucy E., b 04 Apr 1846; d ____ . 16C58.84 Edward H., b 04 Sept 1847; d 09 Aug 1848;. 16C58.85 Florence B., b ____ 1850; d 08 Dec 1853. Subject: Alanson Bigelow of Bioston, Mass. Source: Genealogy of the Bigelow Family of America by Gilman Bigelow Howe. 1. Alanson Bigelow b. Aug 3, 1837; resided at Boston. 3. Lucy E. Bigelow b. April 4, 1846. 4. Edward H. Bigelow b. Sept 4, 1847; died Aug 9, 1849. 5. Florence B. Bigelow b. 1850; died Dec 8, 1853. Amory Houghton Jr was born on 30 October 1837 in Cambridge, MA, USA, age 23 in 1860 census; age 33 in 1870 census; age 41 in 1880 census;Oct 1837, age 62 in 1900 census; MLM: Bolton. He was the son of Amory Houghton Sr and Sophronia Mann Oakes. Amory Houghton Jr married Ellen Ann Bigelow in 19 June 1860 at MA, USA, JWH: Bolton MA. Amory Houghton Jr died on 5 November 1909 at Corning, Steuben, NY, USA, at home, age 72. Amory Houghton Jr and Ellen Ann Bigelow appeared in the census of 1870 of Corning, Stueben Co., NY, USA age 33, glass manufactr, personal property $1500-1000. Amory Houghton Jr and Ellen Ann Bigelow appeared in the census of 1880 of Corning, Steuben Co., NY, USA age 41, a glass manufacturer; and 2 servants. Amory Houghton Jr and Ellen Ann Bigelow appeared in the census of 1900 of Corning, Steuben, NY, USA age 62, glass manufactorer; 224 Cedar St; with a nurse and 2 servants. Notable: The descendants of Amory Houghton Jr would be worth 500 million dollars from the Corning Glass fortune in 1997 (among the 400 wealthiest in the U.S.). Alanson Bigelow Houghton, was born on 10 October 1863 in Cambridge, Middlesex Co., MA, USA, "Lansing", age7 in 1870 census; age, 16, in 1880 census; Oct 1863, age 36 in 1900 census; age 56, NY, in 1920 census; age 66 in 1930 census. He was the son of Amory Houghton Jr and Ellen Ann Bigelow. Alanson Bigelow Houghton married Adelaide Louise Wellington in 25 June 1891 age 27 and 24 Who Was Who: 1890; JWH: 1891. Alanson Bigelow Houghton died on 16 September 1941 at South Dartmouth, MA, USA, of a heart attack at his summer home, the Meadows; also Sept. 15, 1941. Alanson Bigelow Houghton and Adelaide Louise Wellington appeared in the census of 1900 of Corning, Steuben Co., NY, USA age 36, 2nd V. Pres., Glass Works; and a nurse and 2 servants; at 328 East 5th. Alanson Bigelow Houghton and Adelaide Louise Wellington appeared in the census of 1920 of Corning, Stuebin Co., NY, USA and 4 servants. 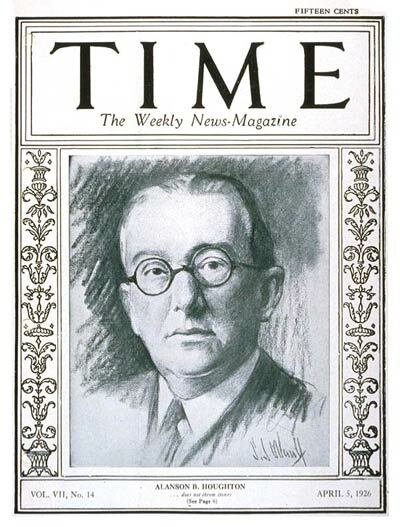 Notable: Alanson Bigelow Houghton was the chief United States diplomat to Germany and the Court of St. James (Britain) between the World Wars and was the only Houghton ever to be on the cover of Time Magazine. On 5 April 1926. He and Adelaide Louise Wellington appeared in the census of 1930 of Washington, Washington Co., DC, USA age 66, director Corning Glass Works; and 6 servants. The "History and Genealogy of the Bangs Family in America: With Genealogical Tables and Notes"
Alanson Bigelow, was born 03 Aug 1837 in Cambridge, Middlesex, MA. He married Sarah Elizabeth Lane. She was born abt 1843 in MA. 24 i. Alanson Bigelow was born abt 1864 in Cambridge, Middlesex, MA; m Frances V. She was born abt 1863 in Massachusetts. + 25 ii. Ernest H. Bigelow was born abt 1868 in MA, and died 1944. 16C58.821 Elizabeth B Houghton was born 12 Apr 1861, d 30 July 1861. 16C58.822 Lizzie Houghton was born 1863, and died 1870 in , , New York, USA. 16C58.827 Anna Houghton was born 1869 in , , New York, USA.